Taylor's Sweet Little Art and Nerd Site: Pin-Up of the Day- Gorilla and Kitten! 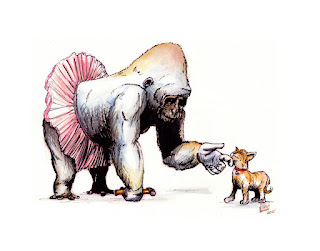 Pin-Up of the Day- Gorilla and Kitten! I was commissioned to make a piece for a present to give to my first Fine Art instructor who is a truly inspiring woman named Robbie Lacomb Roach. (you can see her website here) The instructions were to make a piece that reflected me. That seems like an easy thing to do, but it really isn't. The subject matter came to me while I was eating breakfast one day. I'm not entirely sure what inspired me to do this, but I do like how it turned out. I think my favorite aspect of this piece is the slight uneasiness that the viewer gets from the gorilla. I will have to say that this piece does reflect some aspects of who I am while still appealing to the idea of this being Art with a capital "A". It's not just an illustration piece, it has a message. "What's the message? ", you ask. Well, that is all up to your interpretation of this piece. What I get out of it is the reminder of nature, but that is only my interpretation. Call it what you want. This piece was made on a 14 X11" ragboard. I used watercolor and watered inks to make the wash of the gorilla. I also used colored sharpies to get the bold colors of the cat and the tutu. I used sharpie and india ink for the black line work. You can also see this piece in my deviantart gallery. Action Figure Friday- MOTU Classics- Snout Spout! Taylor's Toy Tuesday- I'm back and DIY Preview!! !